[description] => Any paintings or artwork that is considered to be a music and gig related piece of work. [category_description] => Any paintings or artwork that is considered to be a music and gig related piece of work. 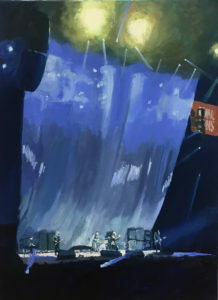 I recently went to Black Sabbath’s “The End” tour and subsequently produced an oil on canvas inspired by their performance. It has been a busy time recently working on paintings of Wishbone Ash, Joanne Shaw Taylor, Status Quo, R.E.M., King King, Broken Witt Rebels and Xander and the Peace Pirates…along with Rival Sons who were an excellent support to Black Sabbath. I hope to re-work this canvas tomorrow and next week….and when it is finished it will be uploaded to my website. There is lots yet to do to it but it is beginning to take shape. Hope you like how it is developing. Rival Sons the finished painting….or is it?